Many patients who have dental crowns or caps can appreciate the experience of having a nice crown pop off or fall off unexpectedly. Sticky candies and jelly beans in particular can pull off nearly any crown, regardless of how well it was cemented. A changing bite can also cause a cap to become dislodged and eventually fall off. When this event occurs during late evening hours or, worse yet, during the weekend or during the holidays when a dentist isn't available it can become quite frustrating. Leaving it off could damage the underlying structure and perhaps be painful. For those who are more daring and replace it "as is".... there is a slight danger of it falling off again and becoming swallowed. Some patients are tempted (and some simply do) to use Super Glue type adhesives. The risk of introducing toxins directly into the oral cavity and onto the exposed tooth structure is something to be avoided. Major drug store chains such as Walgreens and CVS carry some temporary adhesive products specifically made for the "do it yourself" crown re-attachment. All of the featured products below can be purchased for about $6.00 or less. This kit can be found in Walgreens and CVS drug stores. Manufacturer Product Description: A unique, no mix cement made especially for replacing loose caps and crowns. Safe and so effective "you can eat on it"®. 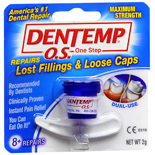 Another commonly available kit that can also be used to temporarily replace a failed filling. Manufacturer Product Description: Provides fast relief of pain and discomfort until you can see your dentist. It is pleasant tasting, safe and so effective "you can eat on it". Manufacturer Product Description: Designed to repair with the same ingredients dentists use. This is a temporary remedy meant to replace a lost filling, cap, crown or inlay until you have a chance to visit your dentist and should only be removed by a dental professional. A crown repair kit sold under the CVS brand available only in CVS drug stores. 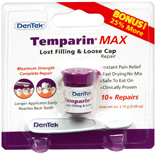 Product Description: Designed to repair lost fillings with the same ingredients dentists use. 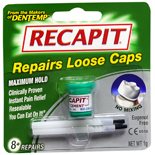 This is a temporary remedy meant to replace a lost filling or inlay until you have a chance to visit your dentist and should only be removed by a dental professional..
Applicator easily reaches back teeth. CVS pharmacist recommended.